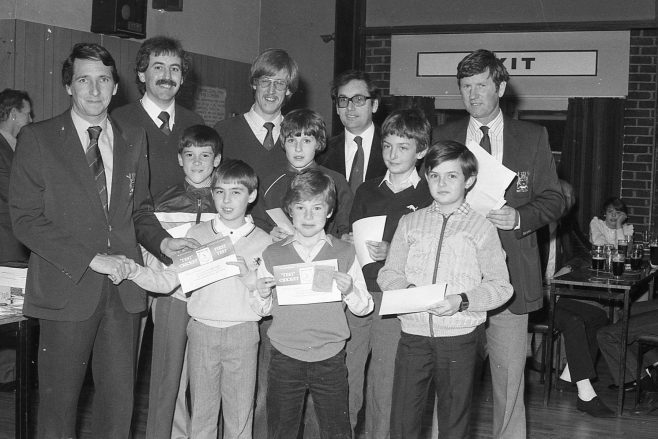 This photograph was taken by a Chad photographer in April 1983 and shows proud youngsters holding Test Cricket Certificates which we believe were being presented to them by the gifted batsman Nottinghamshire and England cricketer Derek Randall. Do any of these youngsters, now grown men still have those certificates and what did they do to earn them? The presentation was at Mansfield Colliery Welfare. The awards were coaching awards run by ECB. Derek Randall and John Cope (far right) were from Notts County Cricket Club, with coaches Peter Rice and Frank Lomas. Derek had travelled up from Lords cricket ground after receiving his man of the match 176 in the centenary test in Australia. Three of the boys are Pascall Broadley, Tim Rice shaking hands with Derek and David Mason front middle.